Build 2015 The first rule of Microsoft's HoloLens is you do not talk about HoloLens. When you're given a demo, you may not take photos, you may not shoot video, and you may not record audio. Given a moment to think about it, this is a strange requirement. After all, everything you see through HoloLens itself is an optical illusion. You couldn't capture it with a camera if you tried. So adamant is Microsoft about its "no electronics" rule, however, that attendees at this week's Build developer conference who wanted a peek at HoloLens were asked to check all of their belongings into lockers before they could proceed to the demo area. Phones were strictly verboten. The second rule of HoloLens is you do not ask questions. That is, you may ask; just don't expect to get any answers. What tech allows the 3D "holograms" projected by HoloLens to occlude your vision so that they look as though they exist in the real world? No answer. What kind of sensors does the headset use to generate its spatial awareness? No answer. What kind of chips are inside the headset and who makes them? What's the resolution of the display? What's the battery life? "We're not sharing a lot of details about the hardware right now." The one thing your humble Reg hack can say with certainty is that the hardware does exist. We've held it in our hands. We've worn it and we've seen it work. What's more, while last time El Reg was given a demo of HoloLens it was with a clumsy prototype version, the model used for a 90-minute developer-focused demo at Build was the same type that was shown off during the conference's opening keynote. It was an entirely self-contained unit that looked and felt sleek and polished enough to be a commercial product. We were warned, however, that it was "early development hardware" and that we should expect a few glitches, not be surprised by them. The software running on it was so raw, we were told, that it was only compiled last week. The first thing you notice when you don the HoloLens is that the experience is nothing like what Microsoft's promotional videos have led you to believe. In the videos, a user puts on HoloLens and is instantly transported to an immersive alternate dimension where computer-generated "holograms" seem to coexist seamlessly with objects in the real world. Out of a surfeit of charity, we'll call that poetic license. A. The real world. B. 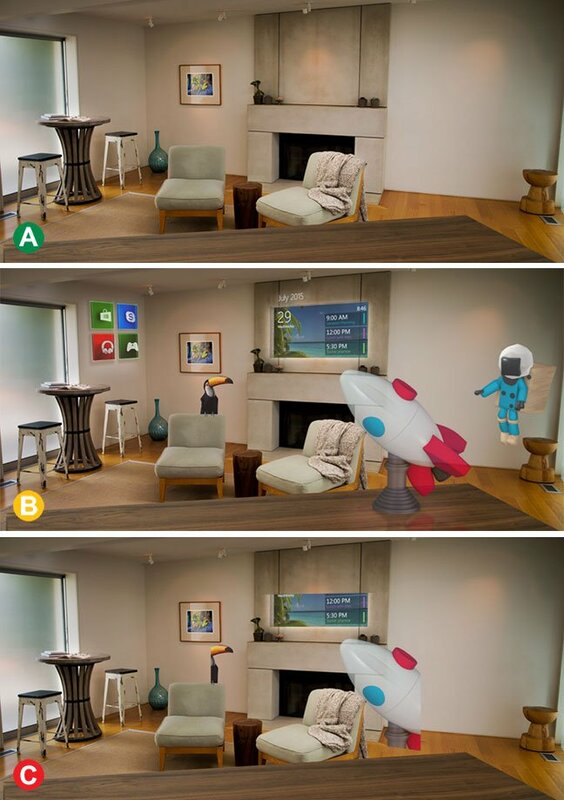 What Microsoft wants you to think the world looks like through HoloLens. C. What it really looks like. Picture, if you will, a window in a wall. Look through this window and you can gaze into another reality, as lifelike and three-dimensional as the world on your side of the wall. Look at the wall, on the other hand, and you see nothing. The world outside the window disappears from view. Now imagine that the wall is invisible. It doesn't really exist; it's just a concept. So is the window. But as long as you can find the window and look through it, you can see the alternate reality.